When you know the size of your collection and all the elements in the collection are of the same type, arrays are good to use but what will you do when you don't know the size of the array in advance? In this case, Vector is very useful when you don't know the size of the array in advance. In this tutorial, we will learn Vector in Java with example and programs in a simple way. ➤ The Vector class was introduced in JDK 1.0. It is present in Java.util package. ➤ Vector is a dynamically resizable array or growable array that means it can grow or shrink as required. It is similar to ArrayList with two main difference. 1. Vector is synchronized. It is used for thread safety. 2. It contains many legacy methods which are not a part of a collections framework. Vector class implements the list interface and extends AbstractList. It also implements three marker interface such as Serializable, Cloneable, and RandomAccess interface. 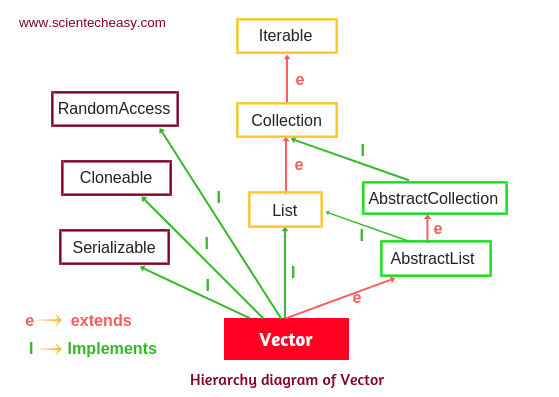 The current hierarchy diagram of a Vector class is shown in below picture. 1. The underlying Data structure for the vector is the resizable array or growable array. 2. Duplicate elements are allowed in the vector class. 3. It preserves the insertion order in Java. 4. Null elements are allowed. 5. Heterogeneous elements are allowed in the vector class. Therefore, it can hold elements of any type and any number. 6. Most of the methods present in Vector are synchronized. i.e It is a thread-safe that means two thread cannot access the vector object at the same time. Only one thread can access can enter to access the vector object at a time. 7. Vector class is preferred where we are developing a multi-threaded application but it gives poor performance because it is thread-safety. 8. Vector is rarely used in a non-multithreaded environment due to synchronized that gives you poor performance in searching, adding, delete, and update of its element. 9. It can be iterated by a simple for loop, Iterator, ListIterator, and Enumeration. 10. Vector is the best choice if the frequent operation is retrieval (getting). Vector class provides four types of constructors to create, access, and modify the data structure. They are listed below in Table. 1. vector() It creates an empty vector with default initial capacity of 10. 2. vector(int initialCapacity) It creates an empty vector with specified initial capacity. 3. vector(int initialCapacity, int capacityIncrement) It creates an empty vector with specified initial capacity and capacity increment. 4. vector(Collection c) It creates a vector that contains the element of collection c.
1. Vector vec=new Vector(); // It creates vector with default initial capacity of 10. Inside the vector class, the data is stored as an array of objects according to its initial size that you specify in the constructor. Since the default, initial capacity is 10. So we can store only 10 elements. When the 11th element is inserted into the vector, the capacity of the vector will be exceeded. In this case. a new internal array will be automatically created that is equal to the size of the old array plus capacity increment specified in the constructor. 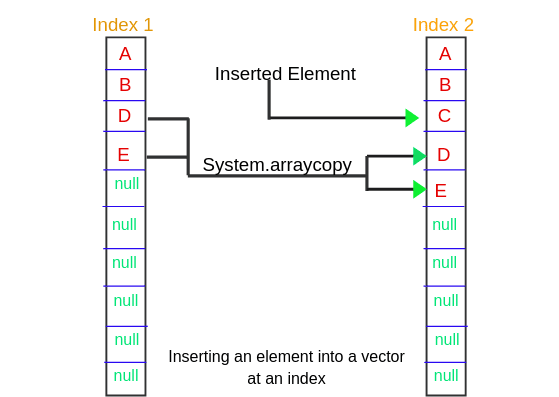 If you do not specify an initial capacity and capacity increment, each time the vector will be resized due to exceeding its capacity and a new internal array will create which copies all the original elements of the old array into the new array by using System.arraycopy() method. Creating a new array and copying the elements will take more time. Therefore, It is important to assign the value of the initial capacity and capacity increment for minimizing the number of resizing operations without wasting too much memory and time. In this object creation, we did not specify any capacity increment in the constructor, so its size will be double by default i.e 20. After resizing, it copies all original elements of the old array into the new array using the System.arraycopy() method and then it will insert the 11th element. When we add an element at a specific position, the vector uses a System.arraycopy() method to move the element from that specific position to the one position down into the array. See the below picture. Similarly, If we remove an element at a specific position, the same process is performed by the vector and the elements will be shifted one position up but the vector is not a good choice in inserting and removal of the elements because it will take more time to copy the elements into the new array and will get slower as the size of the vector grows. Vector vec=new Vector(3); // It will create an empty vector with initial capacity of 3. Vector v=new Vector(list1); // list1 is the elements of the collection. 1. Vector<T> vec=new Vector<T>(); // T is the type of generic. Vector<String> vec=new Vector<String>(); // It will store only string type element. The Vector class provides many different methods to create, access, and modify the data structure. They are given below. 1. boolean add(Object o): It is used to add the specified element to the end of the given vector. It will return true if the specified element is added successfully into the vector otherwise, it will return false. 2. void add(int index, Object o): This method is used to insert a specified element at a specific position into the vector. It returns nothing. v.add(4, "John"); // It adds the element 'John' at position 4 in the vector. 3. boolean addAll(Collection c): It adds a collection of elements to a vector. It returns true if the collection of elements is successfully added in the vector otherwise, false. If the collection is null, it will throw NullPointerException. 4. boolean addElement(Object o): It adds an element to the end of a vector. It increases the vector size by one. 5. int capacity(): It is used to get the current capacity of a vector or length of array present in the vector. Its return type is Integer value. This method does not take any parameter. 6. int size(): It returns the number of elements in a vector. Note: The difference between the size() and capacity() is that size() is the number of elements that are currently held whereas capacity() is the number of elements that can maximum hold. In this example program, you can see that when we added the 11th element in the vector, its capacity become double. 7. void clear(): It clears or removes all elements from a vector. 8. Object clone(): It creates a clone of a vector. 9. boolean contains(Object o): It will return true if the vector contains the specified element. 10. void copyInto(Object[ ] anArray): It copies the elements of a vector into a specified array. v.copyInto(arr); // arr is the reference variable of specified array object. 11. Object elementAt(int index): It returns an element at a specific position. 12. Object firstElement(): It returns the element stored at index position 0. 13. Object get(int index): This method is used to get an element at a specific position in the vector. v.get(2); // It will return an element from position 2. 14. int hashCode(): This method returns hash code value for a vector. 15. int indexOf(Object o): It returns the index of the first occurrence of a specified element in the vector. It returns -1 if the vector does not contain the element. 16. int lastIndexOf(Object o): It returns the index of the last occurrence of the specified element in the vector. It returns -1 if the vector does not contain the element. 17. void insertElementAt(Object o, int index): It inserts an element into the vector. 18. boolean remove(Object o): It removes or clears the first occurrence of a specific element in the vector. 19. boolean removeAll(Collection c): It removes a collection of elements from the vector. 20. void removeAllElements(): It deletes all elements from the vector and set the size of the vector to zero. 21. boolean removeElement(Object o): It clears the first occurrence of a specific element from a vector. 22. void removeElementAt(int index): It remove an element at specific position from the vector. 23. boolean isEmpty(): It is used to check if the vector is empty. If the vector is empty, it will return true otherwise, false. 24. void removeRange(int fromIndex, toIndex): It is used to remove a range of elements from a vector. This method does not return any value. It accepts two parameters. fromIndex: Starting index from where you have to remove. toIndex: the last index as far as you have to remove all elements. 24. void set(): It is used to change the element at a specified position with the specified element in the vector. 25. void setElementAt(Object o, int index): It is used to change an element at a specific position with a specified element within the vector. 26. void setSize(int newSize): It is used to change the size of an internal vector buffer. 27. boolean equals(Object o): It is used to check the equality with another object or element. It returns true if the element is matched. 28. void ensureCapacity(int minCapacity): This method is used to increase the capacity of the vector at a certain size. 29. void trimToSize(): It is used to trim the capacity of the vector to the vector's actual size. 30. String toString(): It converts vector contents into a string. It returns a string representation of the vector. 31. object[ ] toArray(): It returns the elements of a vector as an array. ➤ We want to store duplicate elements. ➤ We want to store null elements. ➤ We are developing a multi-threaded application but it can reduce the performance of the application because it is "thread-safety". ➤ Vector is more preferred when the retrieval of elements is more as compared to insertion and removals of elements. ➤ Vector is a good choice if you want to access the data in the list rapidly and a poor choice if the data in the list is modified frequently. 1. ArrayList is not synchronized. Vector is synchronized. 2. Since ArrayList is not synchronized. Hence, its operation is faster as compared to vector. Vector is slower than ArrayList. 3. ArrayList was introduced in JDK 2.0. Vector was introduced in JDK 1.0. 4. ArrayList is created with an initial capacity of 10. Its size is increased by 50%. Vector is created with an initial capacity of 10 but its size is increased by 100%. 5. In the ArrayList, Enumeration is fail-fast. Any modification in ArrayList during the iteration using Enumeration will throw ConcurrentModificatioException. Enumeration is fail-safe in the vector. Any modification during the iteration using Enumeration will not throw any exception. We hope that this article will help you to learn Vector in Java and its various method with example programs. All programs are very important to clear the concepts. So practice them.